Prego has a 50% discount on all displayed cakes, pastries and bread after 9.30pm. Being a typical Singaporean cheapskate, whenever my parents go to Raffles City for dinner, they would pass by Prego and grab a few of these delicious desserts. One of the must buys is the Chocolate Profiterole. Profiteroles are choux buns filled usually with pastry cream, ice cream or whipped cream. 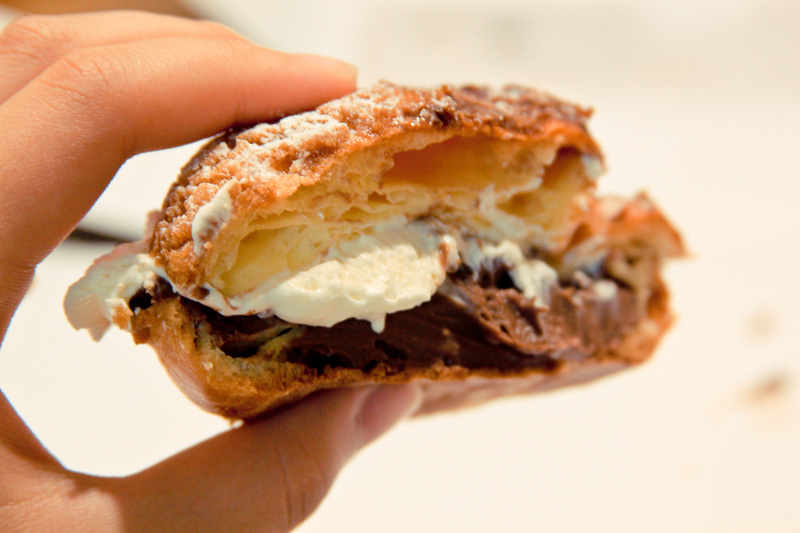 Prego’s profiterole is filled with hazelnut chocolate and Chantilly cream. 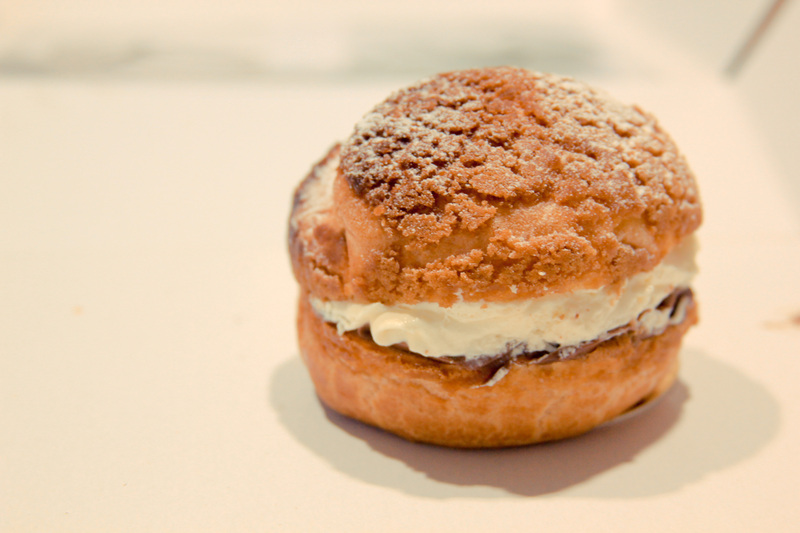 The choux bun is chewy with a crumbly top. Unfortunately, the hazelnut chocolate does not stand out, and there is little trace of hazelnut. However, Prego is generous with the cream and chocolate, making this dessert one sinful treat. Prego’s Panna Cotta is one of my favourite desserts. It is a Vanilla Panna Cotta with Strawberry and Rhubarb compote. Panna Cotta is an Italian dessert made by simmering cream, milk, sugar and mixing it with gelatin, then allowing it to cool and set. There is a very distinct taste of milk in this Panna Cotta, and I love it for that. 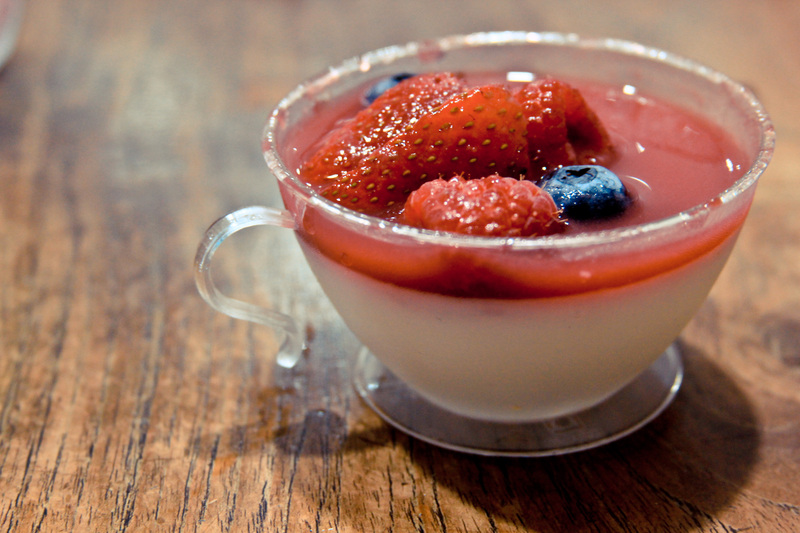 The compote is of the right sweetness and blends really well with the milky taste of the Panna Cotta itself. I love how the Chef manages to sneak a little bit of orange zest into the Panna Cotta, contrasting bright short orange stripes with the creamy coloured Panna Cotta. The zest also cuts through the milky taste, enabling me to eat up a whole cup of Panna Cotta without feeling too heavy. Wonderfully creamy with a hint of orange zest! Pay Prego a visit when you are in Raffles City at night! The desserts are worth the money and worth the wait.